I have two parts to this review, so stick around. I based this rating off my own personal experience, which I am going to start off by going through. The packaging is gorgeous. You get a frosted glass container with a chrome metal lid. It is pretty and luxurious looking and functional. It smells awesome. It's not strong, almost scentless even. But there is that small hint of tea tree (which is kind of a minty scent) that makes it smell fresh. Now for the performance. My skin is DRY. 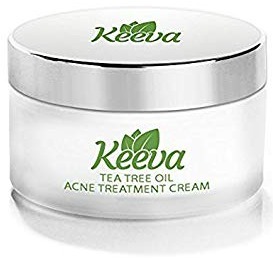 Typically things with tea tree in them do not work for my acne because tea tree dries out the skin. But my sister was swearing by this stuff (she has oily skin) and I thought I would take a stab at it. It is a moisturizer too, so I thought maybe that helped. It is no more hydrating than any cheap Walmart moisturizer. A little did go a long way for the most part though. It did nothing for my flaky skin. I saw no damage repair or skin repair in this. My skin has a lot of scaring and dark spots (because I pick my acne and I had chicken pox as a teenager) and it didn't improve any of that, even though it claims to help minimize the look of scars. I used this for two weeks straight, and my acne got better for the first few days, but after that my acne got WORSE. You guys, don't believe the lie that some skin care makes it worse before it's better. That's not how it works for acne treatments. My acne became painful and cystic. I returned mine. But how about that second part right? My sister has oily skin, and she has struggled with acne her whole life. You guys, her skin has never looked better. Her acne is gone and her face is smooth and clear. I haven't seen an improvement in the scarring, but no acne. That's HUGE for her. I don't think this works for those of us with dry skin, but if you have oily skin it's worth a shot.